Dentures are removable replacements for missing teeth typically made out of an acrylic resin which at times incorporate porcelain or metal for additional structural support. There are two main types of dentures. Both Complete Dentures and Partial Dentures are finely crafted, custom-fitted. If you properly maintain your dentures they will appear natural and provide a perfect smile. Additionally, dentures help strengthen muscles controlling your expressions that require the support of your teeth, rid you of pronunciation problems caused by missing teeth and aid with chewing. Dentures, also known as false teeth, are the primary topic in this section of our site. Here, you can learn how the procedure is performed, what dentures cost and the advantages and disadvantages of having them. You'll also have a chance to see photos taken before and after a patient gets dentures and you will be able to read personal experiences from patients who have them. Finally, you'll be able to discuss dentures with other patients and potential patients. If you've lost, or are losing, all of your teeth a Complete Denture is something to discuss with your cosmetic dentist. If some of your teeth remain and are healthy, a partial denture may be your way to a great smile. Dentures definitely provide a great smile with a very natural appearance. They're made of very durable materials and last very long when properly taken care of. Typically dentures last from five to ten years. They also correct several problems, from speech to chewing, for many patients. There's no doubt that dentures take a little getting used to. There is maintenance involved, and initial speech issues to overcome (these are temporary and last only a couple of days). Mouth irritation or sores may occur, but are usually caused by poor dental hygiene, and not removing your dentures when needed. It is common that your mouth change over the life of your dentures, so even though they last long, they may need to be replaced to achieve a better fit before they are worn out. With a denture a person typically chews at only 15-23% efficiency compared to a person chewing with their natural teeth. In the case of a full upper denture, the upper palate is covered which can reduce taste of foods you're chewing. Dentures are removable replacements for missing teeth typically made out of an acrylic resin which may at times incorporate porcelain or metal for additional structural support. There are two main types of dentures, complete and partial. Both Complete dentures and partial dentures are finely crafted and custom-fitted to the patient. If you properly maintain your dentures they will appear natural and provide a perfect smile. Additionally, dentures help strengthen muscles controlling your expressions that require the support of your teeth, rid you of pronunciation problems caused by missing teeth and aid with chewing. It is somewhat common to require for some teeth to be extracted, and surgery in some cases is necessary to improve the bony ridges that stabilize your dentures. The procedure begins with a wax bite impression of your mouth that will give your dentist exacting measurements. A try-on appointment will fine tunes color, shape, and custom-fit. After your final dentures are fabricated, they will be placed and informed of their required care. Immediate Dentures are placed all at once, and may require additional adjustments after the healing process. It can take months for your bone and tissue to stabilize after tooth extractions. Upper Dentures, tend to be a bit easier to adjust to. These are made of the same materials as a Complete Denture, but are designed to provide you with upper teeth only. Over Dentures are a type of conventional denture similar to Complete Dentures. The difference is that not all teeth are extracted and they use one or more natural teeth for their support. This type provides greater stabilization during chewing. Over Dentures cost more and typically require more preparation dental appointments until the procedure is fully complete. 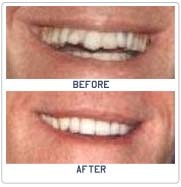 Designed to correct the gaps in your smile when only some of your teeth are missing. Metal attachments anchor the dentures to your natural teeth. Partial Dentures maintain tooth alignment by preventing your remaining teeth from shifting. Partial Dentures can also help prevent your loss of more teeth due to decay or gum disease. << Back to " Dentistry "